Lech am Arlberg is a beautiful village lying on the banks of the river Lech. This mountain pass of the Alps and Tirol states will almost always guarantee snow. Great snow area for all ski levels, excellent choice of hotels, warm hospitality, traditional and tasty cuisine, is what you will find over the mountains of splendid Lech. If you’re arriving by plane, Innsbruck airport is the closest and most convenient airport to Lech. It is well known for the ski charters and good connection with the rest of Europe with the biggest airlines, as well as low budget ones. You can continue your journey to Lech by train from the Innsbruck main train station to St Anton am Arlberg station, which takes approximately 1 hour and 20 minutes. From there, you can take a bus or a taxi to Lech. Another option is to book a private airport transfer from Innsbruck airport to Lech. This is a door-to-door service and is especially convenient for transfers to ski resorts because the taxi driver will pick you up at the airport and take you right to the doorsteps of your accommodation. The private taxi transfer takes considerably shorter time compared to public transport. The Lech taxi fare is a fixed amount and per vehicle, which means the cost is split among the travellers and in some cases is lower than other airport transfer options. Depending on the number of people, luggage amount and ski equipment, you can book a car, van or bus. The slopes are well groomed, ultra-modern heated chairlifts, breathtaking scenery, good après ski up the mountain and down the village, free shuttle to the nearby valleys and villages. The well-connected ski area will allow you a visit to Warth, Zurs, St. Anton and Stuben. 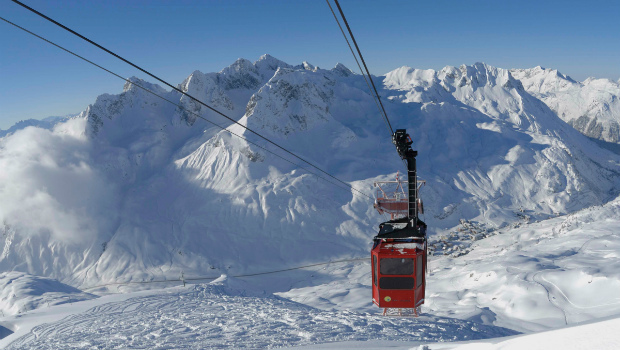 For incredible vistas, you can go up the Rufikopf Bahn in Lech and ski down to Zurs. The intermediates can try the Weisse Ring – the white ring run, which is a good extent at about 20 km. A big subsidiary of Strolz that will satisfy your skiing needs and much more! Don’t miss the end season sale to buy the best selection of ski gear! The friendly and knowledgeable staff will make sure you make the right choice of equipment and clothing. Once in front of the large display windows situated in the heart of Lech, you will be tempted to enter this unique store. The store is spread over six floors and each floor Is lighted, welcoming with a traditional touch – simply amazing! There are clothes for every occasion: traditional dirndls, wool jackets, hats and other apparel from Habsburg, Stajan, Meindl and Gössl; top ski clothing brands: Bogner, Moncler and Lasse Kjus; evening wear from the latest collections of Fendi, Missoni and Moschino and everything you need and want of the latest trends in ski gear. The lower floors are for home accessories, children’s wear and ski boots. Then, on the up levels, you will find designer men’s and ladies’ skiwear, the designer clothes, shoes and handbags. You can also celebrate the good shopping in the small champagne bar on one of the floors. One of the things on your “to-do” list, especially in summer, is the visit of Geoweg Ruefikopf. It features a great network of paths for all ages and pleasant walk with stunning views. The Geological trail will take to a journey through time, along the Steinerner Zeugen – the Stone Witnesses. The trip starts at the summit station of Rüfibahn (2,350 m) which is the beginning point for hiking, climbing and paragliding. Enjoy the breathtaking view from the panorama restaurant or the terrace. There are about 23 stations with rock strata and beautiful flowers and herbs. The journey that started 200 million years ago chronologically is shown in a 2.5-hour walk with stunning views of the hills and valleys. Improve your ski performance and enjoy the skiing with very friendly and fun instructors! Bilingual ski instructors will improve your skiing or give you the confidence to try the challenging route. Great experience for both, children and adults. Telemark, accompanied piste skiing, heli-skiing are some of the techniques that this school offers. Group and private classes by professional children’s ski instructors from the first turn in the show, to off-piste experience away from the groomed slopes for the adults. With a focus on your personal goals, the instructors will show you how to develop your skills to reach your potential and experience the sport in a way that most skiers never do.